These Neiman Marcus Chocolate Chip Cookies have a secret ingredient — ground oats! I’ve been making these for 10+ years, they’re always a crowd favorite! They have such a delicious flavor, a great texture and they’re packed with chocolate. 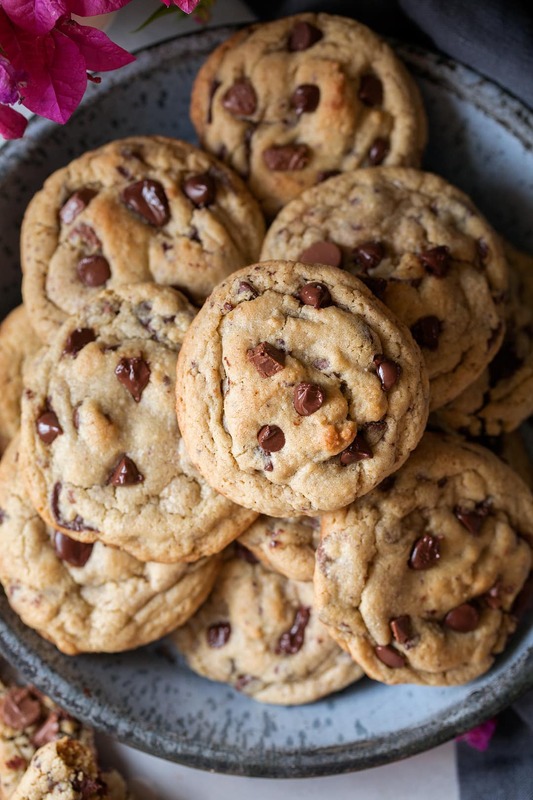 I got this chewy chocolate chip cookie recipe from my cousin when I was a teenager, and it’s been a favorite ever since! She made a batch of these and I had to have the recipe, I was totally smitten. 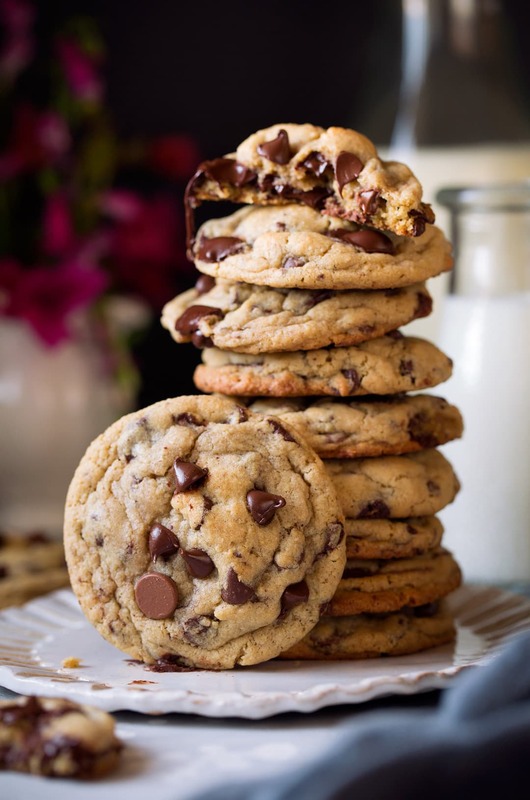 The story goes, that supposedly a woman was dining at the Neiman Marcus Cafe in Dallas, Texas and loved their chocolate chip cookies so much she asked for the recipe. She was told by the waitress that for two fifty she could have it. She agreed and later the credit card bill arrived and that was $250. Is it true? Not sure, but either way these Neiman Marcus chocolate chip cookies are so unbelievably good! And I had no idea they had oatmeal in them because it’s ground up like a flour. I love the flavor the oatmeal adds without being overbearing. Plus, it helps thicken up the cookies so you don’t end up with those squatty flat cookies. 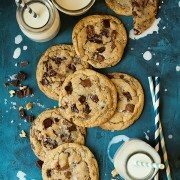 These are thick and deliciously chewy chocolate chip cookies. Grind outs in a food processor. In a bowl whisk together ground outs, flour, baking soda, baking powder and salt. In an electric mixer cream butter and sugars. Blend in flour mixture, then mix in chocolate chips and chocolate, and walnuts if using. Scoop dough out nearly 1/4 cup at a time and shape into balls. Transfer to baking sheets and bake until set. Just be sure to under-bake these slightly so you don’t end up with a dry cookie. The centers should be moist and chewy and you should have those buttery, crisp edges. How Do I Know When Cookies Are Finished Baking? 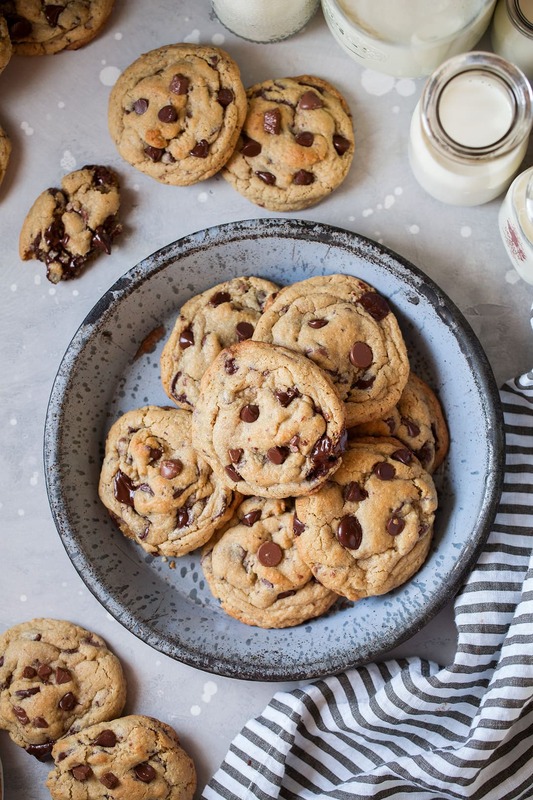 You’ll know that these homemade chocolate chip cookies are ready to come out of the oven when they’ve gone a light golden brown around the edges and on top. The centers of these cookies will be slightly moist when you take them out of the oven. Can I Use Salted Butter Instead of Unsalted? It’s best if you use unsalted butter, otherwise these cookies might be too salty. Remember that you’re also adding in 3/4 teaspoon of salt as well. These Neiman Marcus chocolate chip cookies can be kept in a sealed container on your countertop for several days. If they go a bit stale, just dunk them in a little milk. To freeze these cookies, let them cool completely on your counter. Then freeze them in a freezer-safe bag and reheat them in the oven on a low heat when you’re ready to enjoy the leftovers. Under-bake the cookies. These homemade chocolate chip cookies won’t look completely done when you take them out of the oven, but remember that they’ll continue cooking on the hot cookie sheet. 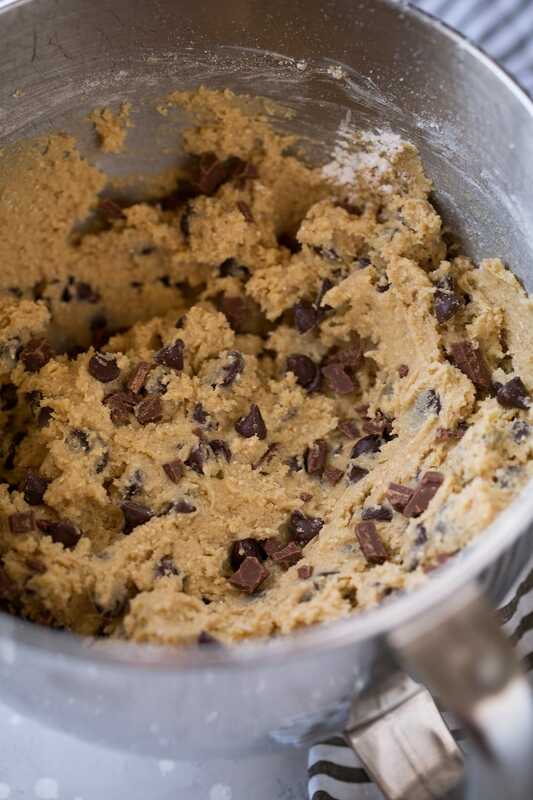 The butter should be softened, but still slightly firm when making the cookie dough. If you don’t have a chocolate bar, you can add in more chocolate chips instead. 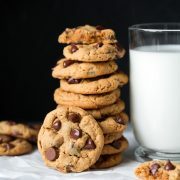 The famous Neiman Marcus Chocolate Chip Cookies, with the secret ingredient - ground Oats! I've been making these for years and they're always a crowd favorite! They have an irresistible flavor and a delicious chewy texture. Preheat oven to 375 degrees. Add oats to a food processor. Process oats until they are very finely ground, nearly to a flour, about 2 - 3 minutes. Add ground oats to a large mixing bowl along with flour baking soda, baking powder and salt. Whisk 20 seconds. Set aside. In the bowl of an electric stand mixer fitted with the paddle attachment cream together butter, brown sugar and granulated sugar until well combined. Mix in eggs one at a time then blend in vanilla. With mixer set on low speed slowly add in dry ingredients and mix just until nearly combined. 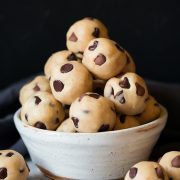 Add in chocolate chips, chopped chocolate and walnuts if using and mix (you can set a few chocolate chips aside first if you want some to press into tops of dough for looks). Scoop dough out 2 oz. at a time (nearly 1/4 cup) and shape into rounds (at higher altitude I recommend making taller dough balls, so more of an oval shape, for less spread). Transfer 9 dough balls to an 18 by 13-inch baking sheet lined with a silicone liner or parchment paper, spacing them about 3-inches apart (refrigerate dough that's not currently baking). Bake in preheated oven until nearly set but slightly under-baked, about 10 minutes. Let cool several minutes on baking sheet then transfer to a wire rack to cool. Repeat process with remaining dough. Store cookies in an airtight container. Scoop into measuring cup and level top to measure flour. Walnuts not included in nutritional info.